And without fail, I'm inspired again by Steph's awesome blog content. She seriously has the best blog topics! 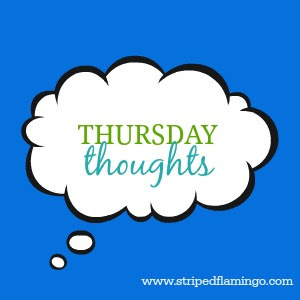 Yesterday, she posted "Things I'm Not Doing" and I was inspired to do my own version for today's Thursday Thoughts post. Decorating for fall. (echoing Steph) I tried. And I just can't do it. I'm about to tear my house apart in a month for Christmas so decorating for fall is just too much. Plus my interior is all cool colors...I.E. not orange. I ventured into a burlap wreath and spray painted a chicken wire pumpkin which I now think just looks weird. Drinking coffee. This is where I stop being basic. I don't drink coffee...at all. No PSLs, no cappuccinos, no frappes...if it contains coffee I will not be drinking it. Able to find time between now and mid-November for M and I paint our kitchen cabinets. Seriously, between work travel and other trips/things we have planned, we're booked solid! Buying Hewitt another Halloween costume. We've tried before with the clothes and he just won't have it. He shuts down. He won't even stand up or, worse, he pees on them. I briefly entertained the idea of getting him some dog grip socks since he slides on our hardwood floors but I think he'd hate me forever. Toting around old, raggedy, or free-gift-with-purchase luggage. I've started traveling more with work so I bit the bullet and invested in some grown-up matching luggage. It's a three-piece set and I got a great deal on it from E-Bags. Now you're turn! Tell me what's going on with you and link up below! I don't do coffee either. I don't like anything remotely coffee flavored. Not coffee ice cream. Not tiramisu. Just no. I don't drink coffee either! Yay spirit sisters. And good luggage is key. I travel a lot too so I have to know when it's time to retire pieces. I am tired just thinking about decorating for Christmas.